Costs – What are your cost expectations for tree maintenance or removal in Hartford? What about stump removal? We have those average costs for you to compare against quotes. 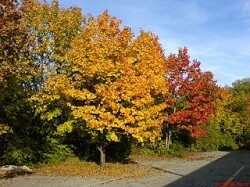 FAQs – If you’re considering planting new trees in your yard, know first which ones will actually survive the seasons. There are certain pests to be aware of in Hartford, along with specific fruit trees that will blossom and some that won’t. Learn more. Services – We have all of the professionals in Hartford who can come out and get started as soon as possible. Call one today. How Much Do Tree Services Cost in Hartford? Conscientious tree care is an excellent habit to develop. Maintaining trees not only adds economic value and aesthetic appeal to a single property, it sustains the well-being of other people and trees in the community. The price range for tree maintenance and removal differs from region to region. Here are the typical costs reported for Hartford, Connecticut. When Hartford trees reach the end of their lifecycle, they must be cleared out of the way. Dead or decaying trees are hazardous because of the danger of fragmentation and falling branches. The price depends on several factors, especially the size of the tree and the difficulty of the job. In Hartford, $870 is the average price paid for tree removal. Most homeowners receive a bill between $700 to $1,035, but the full pricing spread ranges from just $200 to $1,500. After a tree is removed, the stump must be cleared away. Local stump removals are priced starting at $77 for a medium-sized stump and $85 for a large one. On the higher end, however, some contractors in Hartford charge as much as $140 to $147. Keep in mind that, like tree removals, the cost of stump removal depends on the stump’s size and the rigor of the job. Homeowners will usually need to pay more for very hard wood, debris-ridden soil and unmanageable root systems. Tree maintenance is about reacting to problems as they arise. But, proper maintenance also takes a proactive stance, using techniques like pruning to enhance the natural development of the tree. This is especially true of trees planted in urban areas. Nationally, the average price for tree maintenance service is about $485, commonly no more than $580 on the high end. Although a few paid less than $100, others report a bill as high as $1,000. Affectionately known as “a city in a forest”, more than one-fourth of Hartford, Connecticut is covered by green trees. That amounts to more than half a million arbors dotting the urban landscape, including 55,000 massive ones, all providing valuable health benefits and energy savings. The populous capital of the Nutmeg State, Hartford is a haven for some of the oldest, largest and most treasured trees in New England. Trees that rise above 100 feet in Hartford include black, red, bur and pin oaks; eastern cottonwood; eastern and western white pine, and tulip trees. 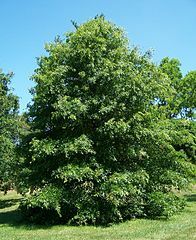 The city is also home to numerous lofty specimens of Connecticut’s state tree, the white oak. Also called the charter oak, this tree is named for an interesting early episode in the history of New England. Facing the armed seizure of their territorial charter, early Connecticut patriots defied the British monarchy by hiding their founding document inside an old white oak tree. The municipal government acknowledges that it has a significant stake in the long-term health of Hartford’s forest. The city has an overarching goal of expanding the urban shade tree cover for the greater health of the community. The tree ordinance of Hartford was written to facilitate this goal. No one is allowed to top a tree in Hartford. A permit is needed to remove a grove of trees or any tree with a diameter of 13 DBH or greater on private property. The state Arborist Law requires anyone who cuts down a public or private tree to have a state-issued license. There are, however, exemptions if a tree poses an imminent danger. Before planting a new tree, it’s important to consider the principle of the “right tree in the right place”. While it is the duty of the electric company to trim back trees that could interfere with power lines, Hartford residents who plant new trees are encouraged to deter future problems by planting tree varieties that can reach their full height without growing into nearby electrical power lines. Located in the rolling hills of the Connecticut Valley, Hartford’s climate matches the typical chill of southern New England although it has a more temperate climate than the nearby uplands. With an ecology dominated by the life-giving Connecticut River, Hartford boasts fertile, if alkaline, soils and delicate floodplain forests with trees like cottonwood and the silver maple. Cold weather is the principal threat to fruit trees in Hartford, particularly sudden drops in temperature following pockets of autumn warmth. As such, growers should choose cold-hardy fruits that have been recommended for USDA Hardiness Zone 59a. Many varieties of apples, for example, are grown in Hartford. Certain types of cold-adapted peaches and nectarines can also be grown here, like harbinger and Rochester peaches and Mericrest nectarines. Other viable fruits include cherries, apricots, plums and pears. 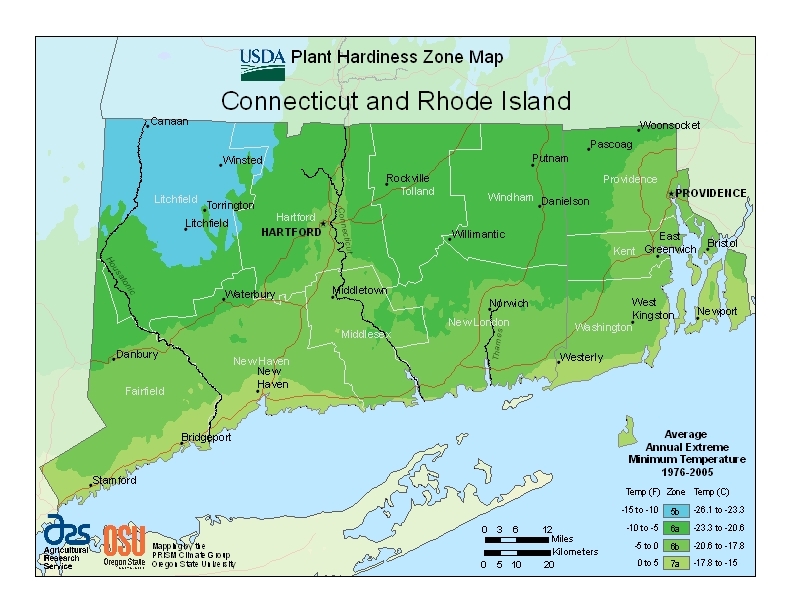 Tree planting in Hartford must be done with careful consideration of local pests and diseases. The emerald ash borer, an infestation of national scale, was found in Hartford in the summer of 2013. Ash trees are common in Hartford and could be at significant risk. Although no known cases of sudden oak death have yet emerged, the causal pest has been spotted in the state too.